I met Erin at a wedding expo in Orlando, FL and I fell in love with her work. She worked with our tight timeline and also our budget. But the most important thing is that, at the consultation, she captured our personalities and showed them in our invitations. They were unique and 100% custom made. We absolutely LOVED them... I am still obsessed with them. Everybody said that they were one of the most unique, beautiful and original invitations that they have ever seen. Definitely Proton Paperie is the perfect option for your wedding invitations. 100% recommended. The owner and designer is extremely creative and listens to your likes and dislikes and generates perfectly to your requests. When we met, I had wedding colors, a wedding location and elegant theme in mind, and looked at examples she had and told her what I liked and disliked about them. She, then, created our perfect Wedding invitations including RSVPs, Info cards and directions cards and our Wedding programs and place cards all to match. 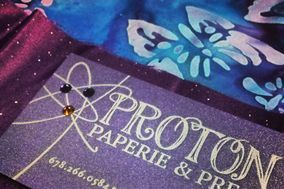 If you are looking for high quality stationary with personality, beauty, and sparkle, you want Proton Paperie. The owner did my birth announcements and thank you notes for my second daughter. She is a true artist; each design is unique and amazing. I gave her a general idea of what I wanted, and all my items were exactly as I imagined them. Stylish and classy but still sparkling and pink and cheerful! My older daughter was so impressed, we had to order her some stationary too. We also purchased personalized note cards as Christmas gifts. Each item has been unique and special and of the finest quality. Erin made beautiful birth announcements for me. She is very professional, responds immediately, and was quick with sending me my announcements. I will order from Erin in the future for my invitations, announcements, and anything else I need printed.